Today I show you how to make Vegan Candy Cane Christmas Brownies! These indulgent christmas treats will definitely let your taste buds know that it is holiday season. You can make these brownies ahead of time and even freeze them for the day you want to use them – a great way to get ahead of the game for your christmas entertaining! Place your pitted dates in a large bowl and cover them with the juice of 1 whole lemon and enough filtered water to just cover all of the dates. (See video at top of page for demo). Let them sit at room temperature for at least one hour. Once the dates have soaked, remove them from the liquid with a slotted spoon and place them into a blender. Then add half a cup of the soaking liquid to the blender also. Add remaining wet ingredients to the blender and blend until smooth. Set aside. Get a mixing bowl and add the chocolate mix ingredients (excluding the plant milk). Stir through so that everything is well mixed. Add in the plant milk and the wet blender mixture, and stir until well combined. Be sure to mix all of the flour through from the bottom of the bowl. Pour mixture into a 20cm/8 inch square cake pan lined with non-stick parchment paper. Place in preheated oven for 45 minutes or until a skewer comes out clean. Let cool for several hours or overnight in the refrigerator. Place your tin of coconut cream in the refrigerator for several hours or overnight. This will lift the solids to the top of the can and the liquid to the bottom. Turn the can over and open it from the bottom (liquid side). Pour off the liquid and reserve for use in other recipes or smoothies. Place the firm coconut cream into a mixing bowl. Add the vanilla extract and whip with an electric beater until fluffy. Set aside in fridge until brownies have cooled down completely. Or make it once the brownies are already cooled. 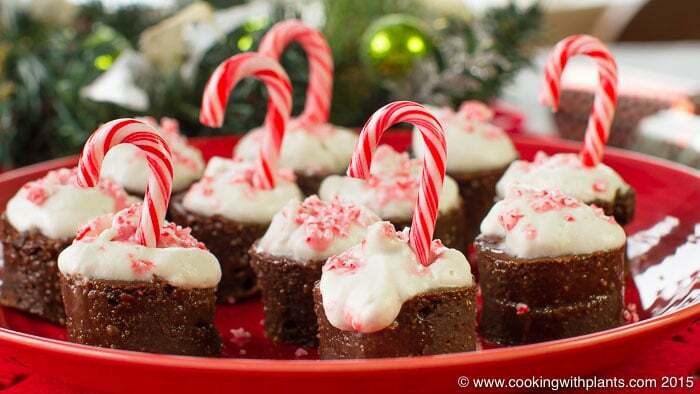 Decide if you want to place some whole candy canes in your brownies when serving. If so, keep these whole. With the rest of your candy canes, pulse them in a blender, food processor or by placing them in a zip lock bag and bashing them with a rolling pin. HANDY TIP: You can keep the rest of the date soaking liquid for smoothies, to make porridge or for any other cooking where some sweetened water would taste yummy. Just place in a screw top jar and keep in the fridge for up to a week). Think this would work substituting carob powder for the cocoa? Thanks for all your hard work with recipes for Christmas, much appreciated. I would like to wish you and your family a very Merry Christmas and all the best for 2016. Would refrigerating the can upside down make for an easier job with the can opener? The rounded bottomed cans would be very hard to open at the wrong end. I have not heard of cans (tins) of coconut cream in US. What else could I use?